Women had always been important contributors to farm labour, but before 1914 milking was mostly considered to the a male role. Female workers didn’t earn so much from farming either. In 1914, 1027 women worked mainly part-time on 590 Wiltshire farms, those being mainly pastoral. During the first year of the war their pay was so low that in Wiltshire, widows sought supplementary relief from the Poor Law for relief to their earnings of 1s per day. In 1916 the Wiltshire Agricultural Committee instigated a register of women willing to work on farms. 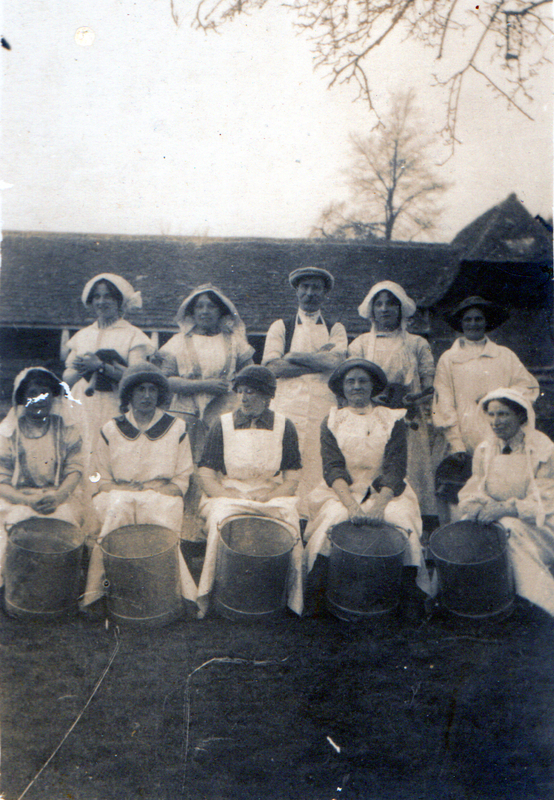 By mid-1918, 2,590 women – one-third full-time and the rest part-time – worked on Wiltshire farms. 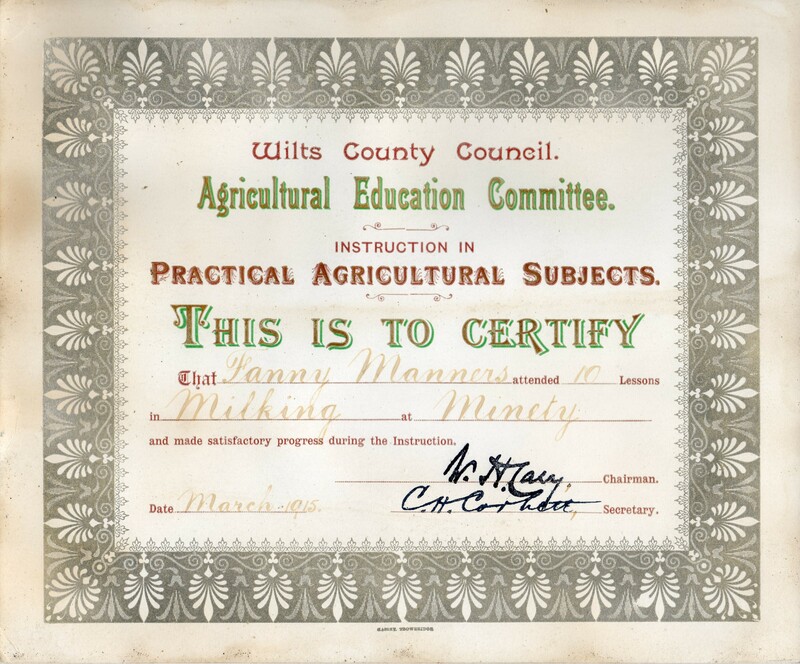 The WAC also set up a scheme to train young urban female volunteers, mainly from outside the County, to take 3-4 week courses to become milkers and then be billeted on farms. 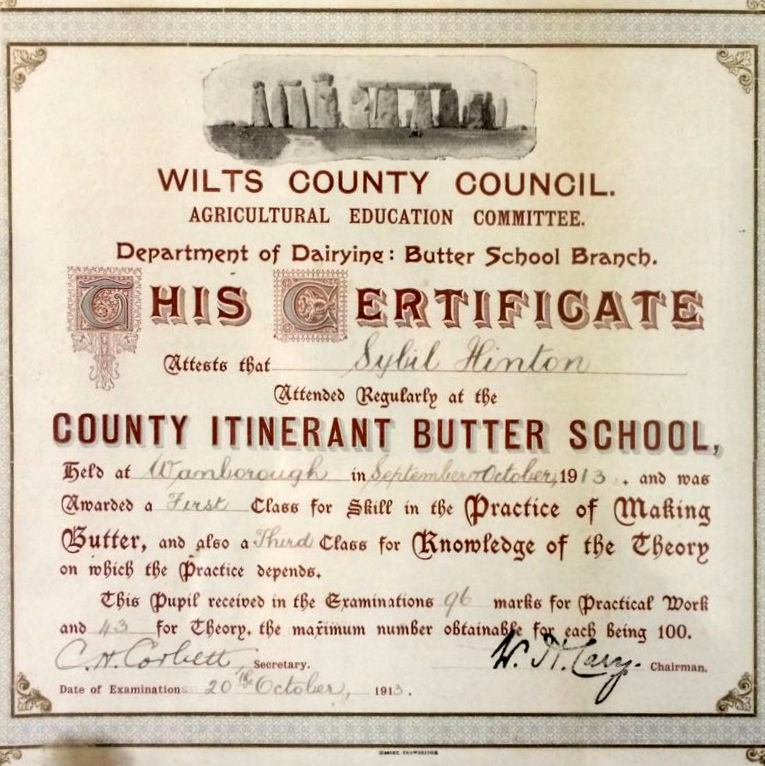 Women workers had to qualify further to enable them to make butter. Sybil Hinton was a granddaughter of James Hinton – Mayor of Swindon in 1904. She and her two sisters Margorie and Vera went on to work at the local farms – Inlands, Pond Farm and The Croft, in Wanborough. Their brothers Frederick and Edgar served with the Royal Wiltshire Yeomanry from 1914, and sadly Edgar was killed in action on 21st March 1918.